In October 1855, construction began on one of the most important artificial waterways, the Albemarle and Chesapeake Canal. Today, the Albemarle and Chesapeake Canal is maintained and operated by the U.S. Army Corps of Engineers and is part of the well-traveled Atlantic Intracoastal Waterway. It consists of a sea level water connection between Chesapeake Bay and the Albemarle Sound. The Canal has the distinction of having been one of the earliest of all American canals, suggested and actually surveyed and mapped in 1772. Construction of the canal could not begin until technology had advanced to allow steam power to operate mechanical dredges. In 1856, nine “Iron Titans” were obtained and went to work chopping out living and petrified trunks. The “line of navigation” of the canal measures some 70 miles, with only 14 miles of land excavation. 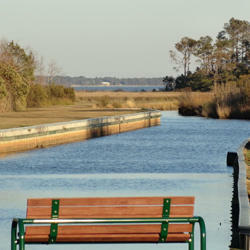 The North Carolina cut is five miles long and slices across the Currituck Peninsula at the village of Coinjock to enter the North River, flowing south into the Albemarle Sound. Norfolk, Virginia merchant and ship owner, Marshall Parks, was the person responsible for reviving the 18th century canal-building plan. Parks worked to get bills passed through both the Virginia and North Carolina legislatures simultaneously. The New York engineering firm Courtright, Barton and Company contracted to dig the canal. The dredging of the two land cuts at a depth of six feet was finally accomplished in 1858. On January 9, 1859, the company’s little dispatch boat, the Calypso – a “pony” side wheel steamer 50 feet long by 9 feet wide – made the first transit of the canal, towing the 110-foot barge Enterprise of Roanoke. In 1912, the canal company, now in financial straits and unable to meet mortgage payments, was purchased by the United States government. During World War II, enormous quantities of military cargo used the Intracoastal Waterway, safe from the submarine active off the Atlantic. This beautiful Carolina canal has served the nation well for 150 years and is a monument to the ingenuity of American’s civil engineers. Source: Alexander Brown. Juniper Waterway. Mariners Museum, 1981.